CEU classes don’t have to be dry power points, online testing or simply a way to fulfill requirements. The Institute offers continuing education and CEU credit opportunities for educators, therapists, artists, counselors, students and interested individuals. 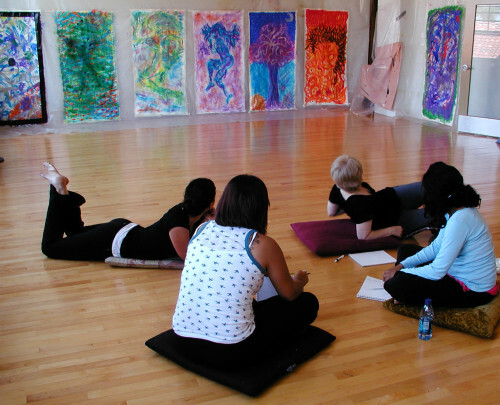 Among the offerings are day workshops in movement and eco-psychology, a two weekend/ four day Introduction to Expressive Arts, and various courses designed to offer a look inside the world of expressive arts therapy for students and professionals. Don’t need CEU’s? No worries. The Institute offers class and workshops that are fun to boost your creativity, be immersed in the artistic process, and make your own life more vital, creative, and fun. See our special events page for listings. Judith Greer Essex, Ph.D., the program director began her career as an actress and dancer before returning to UCLA to earn her MA in Dance Therapy. She has since continued her own education to earn degrees in both Marriage Family Therapy and Expressive Arts Therapy. She is Registered Expressive Arts Therapist (REAT) and licensed MFT who has been working in arts based therapies since 1972. Through the Institute’s continuing education program, we can provide LMFTs and LCSWs and LPCCs with CEU credits. Judith is also a qualified supervisor in Expressive Arts Therapy, and Marriage and Family Therapy for those seeking supervision hours towards licensure or registration.